The new report by Zion Market Research on the “Organic Fluorochemicals Market, By Product Type (Aliphatic Compounds [HCFCs] and [HFCs], and Aromatic Compounds [Ring-Substituted], [Side-Chain Substituted], and [Fluorobenzene]), By Application (Automotive, Pharmaceuticals and Agrochemicals, Refrigeration, Steel, Blowing Agents, and Electronic Consumables) – Global Industry Analysis, Size, Share, Growth, Trends, and Forecast, 2016 – 2024" has vast information about the market and its potential. 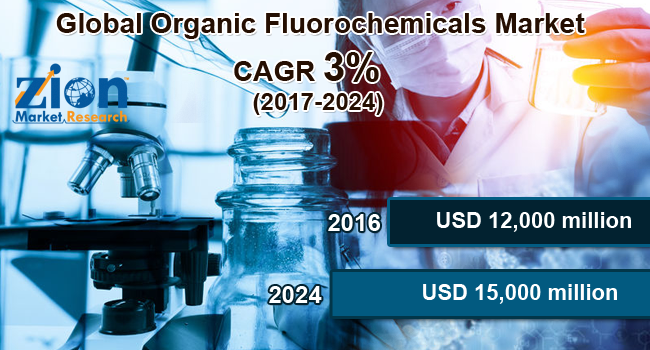 The global organic fluorochemicals market was valued more than USD 12,000 million in the year 2016 and it is expected to reach over USD 15,000 million by 2024. The global organic fluorochemicals market is expected to exhibit a CAGR of more than 3% between 2017 and 2024. In terms of volume, the demand for organic fluorochemicals is expected to reach around 3,000 kilotons in 2024 growing at a CAGR of more than 3% during the forecast period. Our research analysts observed that organic fluorochemicals consisting aliphatic compounds have leading share and accounted for around 90% market share in 2016. Aliphatic compounds segment (HCFCs and HFCs) might observe a decline in demand owing to impending and already enforced a regulatory ban on usage of these organic fluorochemicals. In the product type segment, organic fluorochemicals consisting aliphatic compounds hold the major market share. The organic fluorochemicals consisting aliphatic compounds dominated the market in 2016 with around 90% market share. Hydrochlorofluorocarbons (HCFCs) and hydrofluorocarbons (HFCs) are widely used for refrigeration applications in various industries owing to which they have an increased demand since refrigeration is required in HVAC systems, refrigerators, automobile ACs, and cold storage, among others. The organic fluorochemicals consisting aliphatic compounds are further sub-segmented into hydrochlorofluorocarbons (HCFCs) and hydrofluorocarbons (HFCs). Aromatic compounds are further sub-segmented into ring-substituted, side-chain substituted, and fluorobenzene. Side-chain substituted compounds held more than 70% share of aromatic compounds in 2016. In the application segment, refrigeration is dominating the global organic fluorochemicals market. Organic fluorochemicals are widely used for refrigeration and cooling purposes in refrigerators, ACs, cold storage centers, and HVAC systems, among others. HCFCs and HFCs replaced CFCs as leading chemicals for refrigeration and cooling purposes after CFCs were banned owing to hazards caused by the ozone layer by its usage. Automotive, pharmaceuticals and agrochemicals applications also contributed a major share in the global organic fluorochemicals market in 2016. The Asia Pacific dominated the global organic fluorochemicals market in 2016 followed by North America. Increasing number of manufacturing, chemical, and automobile industries and increasing usage of refrigerants and cooling solutions are expected to boost the market in this region. The Asia Pacific is also expected to be the fastest growing region over the forecast period. China, Japan, India, ASEAN, and South Korea, among others, are the leading countries in the Asia Pacific for organic fluorochemicals market. The environmental concerns regarding usage of certain fluorochemicals and the strict implementation of the ban could hamper the demand for fluorochemicals during the forecast period in this region. The North America organic fluorochemicals market is a comparatively mature market and is expected to grow at a sluggish pace during the forecast period. The major market players in the organic fluorochemicals market are 3M, BASF Chemicals, DuPont, Air Products & Chemicals Inc., Solvay SA, Arkema, Asahi Glass, and Honeywell, among others.